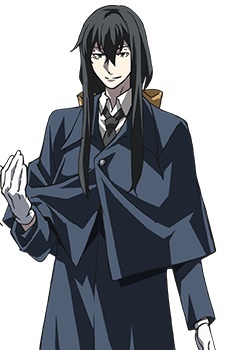 Mercurius "Karl Ernst Krafft, Cagliostro, Eigo-Kaiki, Fourth Heaven"
An ominous magician and alchemist who created Ewigkeit and established the Obsidian Round Table. He was the one responsible for turning the LDO from a clique of elite army officers merely dabbling in the occult into a den of genuine demons. Not only is Mercurius the one sworn friend of the Table's leader, he also stands as the only being capable of matching his sublime prowess. Although his position could be considered that of a mentor and a father, the other LDO members—with the exception of their master—shun him as a hateful taboo. His whereabouts have remained a mystery for the past six decades.